As the federal government’s fiscal year enters the final stretch, information technology vendors are finding the market conditions trying in several ways. Security clearance backlogs, tough competition for talent in the Washington, D.C., metropolitan area, and a budget squeeze caused by the ongoing conflicts in Iraq and Afghanistan have many companies on edge. On the procurement policy front, some industry groups take issue with the recommendations emanating from the government’s Acquisition Advisory Panel. Another factor is the prospect of political change in the midterm congressional elections. But industry executives say the short-term discomfort and uncertainty will yield to solid prospects in the long haul. Many believe tighter budgets will translate into an increasing tendency among agencies to outsource projects. Demographics also point to increased contracting opportunities because large numbers of government employees will likely retire in the next few years. In the meantime, contractors eye the market warily. Here’s what they are watching. The ability to obtain security clearances remains a problem for IT services contractors, even though the Defense Security Service is back in action after a 60-day shutdown earlier this year. Executives said the backlog has eased but added that the clearance process continues to be slow. Jim Sheaffer, president of Computer Sciences Corp.’s federal division, said contractors’ ability to quickly address government requirements is constrained when the clearance process lags. CSC has a sizable roster of cleared employees and subcontractor relationships to keep pace with the government’s demands, Sheaffer said. Charlie Erdrich, vice president of business development at Avineon, said smaller companies have it harder than larger companies in the clearance department. Companies of various sizes face the same predicament. As a result, the Washington, D.C., labor market has become extremely competitive. Renny DiPentima, president and chief executive officer of SRA International, said finding and retaining good people are among his chief concerns, adding that those include employees with high-level clearances. “We are all recruiting for essentially the same people,” Kelly said. He compared competition for solid hires in the Washington labor market with the situation at the height of the Internet boom. At that time, Kelly ran a government contractor in New England and competed with commercial firms in the Boston area for software development talent. “The competition for resources is just as stiff” now as then, Kelly said. Employees with clearances aren’t the only limited resource, he added. Some types of professionals, such as information security specialists, are in short supply. Contractors use different strategies to overcome market constraints. Some companies seek to deliver services from areas where competition is less fierce and labor rates are lower. Kelly said some customers insist that contractors maintain employees in Washington, but he added that others may look for cost efficiency and allow some work to occur outside the local market. He said help-desk operations fit that profile. DiPentima said moving work to less expensive areas in the United States makes sense when the customer has no objection. The practice is sometimes called “inshoring” in contrast to “offshoring,” or moving jobs to other countries. “I think it is going to be difficult to compete on some large, bundled jobs” without inshoring, he added. SRA actively pursues work in West Virginia and parts of Maryland and Virginia away from the Washington metro area for that reason, DiPentima said. SRA offers training services from locations such as Newport News, Va., and Warminster, Pa., said David Kriegman, SRA’s chief operating officer. Because military installations perform training nationwide, the customer doesn’t care whether the trainers come from Newport News or Fairfax County, Va., he said. 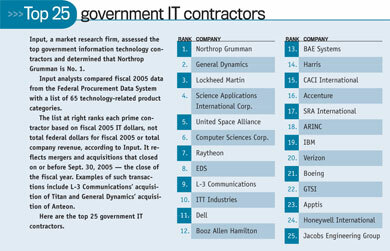 Wartime budgets are another concern for IT contractors. The impact is perhaps most visible in the Army, which announced in July that spending restrictions will continue through the end of fiscal 2006 and into fiscal 2007. Systems engineering and technical assistance contracts may be particularly vulnerable to tightening budgets. Chvotkin said the Army is one organization delaying advisory and assistance contracts. The effects of belt tightening aren’t exclusive to the Army, however. Erdrich said Avineon is evaluating potential Navy cuts that may affect the firm. He added that the funding environment has already caused the service to delay contract awards from September to the next fiscal year. Kelly, meanwhile, cited the Air Force’s plan to cut employees to help fund the F-22 fighter jet and other capital investments. The effects of that change on the contracting community remain unclear, he added. Civilian agencies also feel the pinch. Chvotkin said those agencies face an enormous budget strain in the short term that will impact their ability to field large IT systems. Trey Hodgkins, director of defense programs at the IT Association of America, said e-government projects have suffered on the civilian side. He cited funding cuts and a new congressional oversight requirement. As for the latter, he said, agencies can’t allocate funds for e-government activities unless they obtain explicit approval from congressional oversight committees. He said that order has a chilling effect on e-government projects. Despite the market’s setbacks, industry executives are optimistic. The demand for IT services continues on pace, despite areas of weakness. “We still see strong demand for the kinds of services we provide,” Kelly said. TechTeam focuses on IT infrastructure support, information assurance, managed services and applications services. Overall, government IT executives say they believe IT services will be a solid market, despite the prospects for near-term turbulence. In the short run, industry is likely to see some ups and downs, Sheaffer said, but the long-term trend points to the outsourcing of services. The government’s desire to lower costs and boost efficiency, coupled with the demographics of the government workforce, will drive the outsourcing trend, he said. Even the hardware market, which experts thought would be susceptible to constraints on discretionary spending, appears to be holding its own. Jennifer Smith, area vice president of sales for Dell’s federal civilian and intelligence segment, said war-related spending pressure is palpable but added that she hasn’t seen any cause for concern. Whether the fiscal year’s fourth quarter — the traditional peak buying period — will fulfill its reputation remains to be seen. But at this point, the situation is not significantly different from previous years, said John Howard, business development manager at solutions provider CDW Government and a retired Army brigadier general. IT contractors and industry groups also plan to monitor the fall midterm congressional elections, which could affect future budgets. “We are anxiously watching the results of the election,” Hodgkins said. He said a change in House or Senate majorities would have a significant impact on procurement legislation. The views of the ranking minority members of the committees that deal with procurement issues differ from the committee chairs’ opinions, Hodgkins said. A shift in leadership “would be like night and day,” he said. “The midterm elections will have an impact on the budget as well, and that will be interesting to watch,” Kelly added. He said Congress has funded the war effort, for the most part, through supplemental funding. He questioned whether lawmakers’ willingness to continue supplemental appropriations would continue in a Democrat-controlled House. The potential for additional pressure on the Defense Department budget bears watching, Kelly said. But on matters of politics and budget, contractors prefer taking the long view. Systems consolidation, security and information sharing top the list of technology factors that are shaping the federal information technology market, at least according to IDC’s Government Insights company. Shawn McCarthy, a program manager at Government Insights, said government agencies are under pressure to consolidate multiple platforms onto more powerful servers and reduce software licensing costs. The call for consolidation partially stems from the Office of Management and Budget’s lines-of-business initiatives. Recently reported government security breaches will place a renewed emphasis on security. “There is just going to be continued pressure to get that under control,” said Thom Rubel, research director for government IT value strategies at Government Solutions. As for information sharing, government efforts are coalescing around the National Information Exchange Model. A joint project between the Justice and Homeland Security departments, the model aims to develop enterprisewide information exchange standards. The latest beta version was announced in August. “Typically, anything that is [in its first version] still needs work, but certainly what you are seeing is something greater coming out of previous building blocks,” McCarthy said. The model builds on the Global Justice Extensible Markup Language Data Model. In theory, the National Information Exchange Model could reach beyond DHS and Justice, McCarthy said. The government’s Acquisition Advisory Panel is expected to release a final set of recommendations soon that could effectively set the policy agenda for the next several months. The panel is congressionally chartered to recommend changes to acquisition laws, regulations and governmentwide acquisition policies. It was authorized under Section 1423 of the Services Acquisition Reform Act. At press time, the panel’s final report was slated for release shortly after its Aug. 29 meeting. “That panel’s final report — and how that is viewed in the community at large — will be an important benchmark for acquisition policy issues over the next 18 months,” said Alan Chvotkin, senior vice president and counsel for the Professional Services Council. Industry groups have been critical of the panel’s recommendations. Trey Hodgkins, director of defense programs at the Information Technology Association of America, said a coalition of industry associations has been engaged with the panel since late last year. He said the group opposes three of the panel’s recommendations and is seeking clarification on several others. Industry objects to the panel’s redefinition of commercial services, which it views as limiting the government’s ability to acquire new technologies. Another sticking point: The panel recommends permitting task-order protests on multiple-award contracts. Hodgkins called the measure counterproductive.